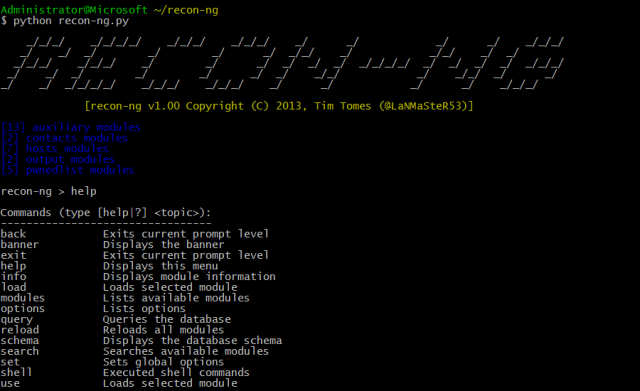 Recon-ng is a full-featured Web Reconnaissance Framework written in Python. Complete with independent modules, database interaction, interactive help, and command completion – Recon-ng provides a powerful environment in which open source web-based reconnaissance can be conducted quickly and thoroughly. Recon-ng has a look and feel and even command flow similar to the Metasploit Framework, reducing the learning curve for leveraging the framework. It is of course quite different though, Recon-ng is not designed to compete with existing frameworks, as it is designed exclusively for web-based open source reconnaissance. If you want to exploit, use the Metasploit Framework. If you want to social engineer, use the Social-Engineer Toolkit. If you want to conduct passive reconnaissance, use Recon-ng! An example on active reconnaissance would be Skipfish by the Google Security Team. Recon ng is a completely modular framework and makes it easy for even the newest of Python developers to contribute. Each module is a subclass of the “module” class. The “module” class is a customized “cmd” interpreter equipped with built-in functionality that provides simple interfaces to common tasks such as standardizing output, interacting with the database, making web requests, and managing API keys. Therefore, all the hard work has been done. Building modules is simple and takes little more than a few minutes. Recon-ng comes with ~80 recon moduloes, 2 discovery modules, 2 exploitation modules, 7 reporting modules and 2 import modules. All 3rd party libraries/packages should be installed prior to use. The framework checks for the presence of the following dependencies at runtime and disables the modules affected by missing dependencies. Change into the Recon-ng directory. Or read on how to use Recon-ng here.